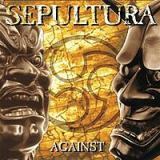 SEPULTURA - AGAINST (CD) | Online Shop | Wizard LTD.
Against is the seventh studio album by Brazilian heavy metal band Sepultura, released in 1998 through Roadrunner Records. It is the band&apos;s first release with new singer and guitarist Derrick Green, who replaced group founder Max Cavalera in 1997. Although still keeping Sepultura&apos;s trademark experiments with percussive music, Against&apos;s overall sound is far removed from their previous record, Roots (1996). Like Roots that preceded it, not only does the album have a variety of guest musicians, but also incorporates a great deal of tribal influences — this time Japanese elements with the assistance of Japanese Taiko group, Kodo. The songs Against, Choke and Tribus were released as singles, with a music video accompanying Choke. The video featured footage from the Barulho Contra Fome (Noise Against Hunger) concert that was the first gig of the Against tour. This famous performance included guest appearances from the Xavantes Tribe who&apos;d featured on Roots (whose appearance is documented in the Choke video) as well as Mike Patton, Jason Newsted, Carlinhos Brown, original Sepultura-guitarist Jairo Guedz and Coffin Joe (whose &apos;blessing&apos; of the band performed during this concert turned up as a b-side entitled &apos;Prenuncio&apos; on the Tribus E.P.). The flute section of Kamaitachi performed by Kodo is very heavily based on that in "The Hunted" which appeared on Kodo&apos;s Ibuki album and was originally composed for the soundtrack of the movie of the same name. The song "The Waste" (a vocal version of Kamaitachi featuring Mike Patton on vocals which appeared on the single b-sides) is featured in the movie Freddy vs. Jason and its soundtrack.